Dieting can often depend on an element of mind over matter. For Marion Corns, it involved nothing else. The mother of three has lost four stone after allowing herself to be hypnotised – and told she had been fitted with a gastric band. Believing her stomach has shrunk to the size of a golf ball under a surgeon’s knife, the 35-year-old is now able to eat only tiny portions of food. And in the four months following the treatment, her weight has dropped to just over 11st 7lb, while her dress size has gone down from 22 to a 14. Over five sessions of hypnotherapy, says Mrs Corns, her therapist talked her through every detailed step of the medical procedure as if she were actually inside an operating theatre. Specialist equipment then filled the hypnotist’s room with aromas designed to smell like a hospital, until eventually Mrs Corns began to feel a tightening sensation in her stomach. 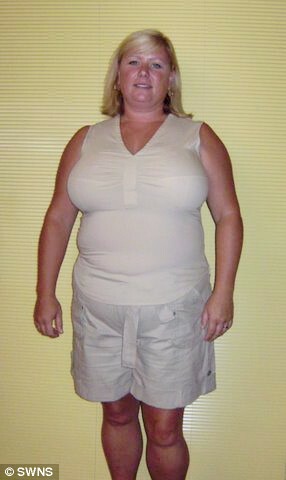 Delighted Marion said: ‘I have tried every other diet and exercise plan the world has to offer. ‘I’ve tried tablets, WeightWatchers, Atkins, Slimfast, milkshakes and even a personal trainer, but none of them helped me. ‘Now I am able to shed up to three pounds a week because I believe I have had a band fitted into my stomach. A real gastric band operation usually costs £7,000 and has the same level of risk related to any major operation including infection and DVT. After revealing how the birth of her three children left her with no time to exercise and admitting gorging on mid-morning bacon sandwiches, big lunches and giant-sized dinner portions, she booked herself in for five sessions with Marion. Using a combination of hypnotherapy and Cognitive Behaviour Therapy, she was taken on a ‘virtual tour’ through the ‘operation’. Therapist also used in-depth guided imagery and visualisation to fit an imaginary gastric band around the stomach, forming a pouch the size of a golf ball. After five sessions of the treatment – which is 100 per cent safe because it eliminates the risks of general anaesthetic, DVT and MRSA – Marion began to feel a tightening sensation in her stomach. Marion added: ‘Now if I try and eat a large portion I feel a pulling sensation in my tummy as if my stomach is stretching. ‘I simply cannot eat large portions of food any more. I did manage to force down a KFC burger once but I felt really sick, as if it was stuck in my throat, and I had to lie down for three hours afterwards. ‘I am thinner now than I ever have been and if I can lose another stone I will be exactly the weight I want to be. Clinic owner Martin began working on perfecting the Gastric Mind Band after a client he helped quit smoking asked him whether it would be possible to convince him he had one fitted. Martin said: ‘This treatment is good for the client, for the NHS and is also ideal for the many overweight adults and teenagers who are sadly part of Obese Britain. ‘Although this form of imagined surgery isn’t in itself new, its application in the weight loss field is believed to be pioneering. Martin, who himself has lost 50lbs through a gastric mind band, said: ‘The different therapies help patients rethink their whole attitude to food so they adopt a new lifestyle of healthy eating. ‘It is not a temporary solution. It is a long term thing. Jacqui Lowdon, dietician and spokeswoman for the British Dietary Association, said she could see why the treatment would be attractive to a lot of people. And she added: ‘This is quite a novel idea and I’ve certainly never come across it before. ‘Gastric bands are available on the NHS to those who have problems with their weight, but there are a lot of side effects. ‘If this works and people can achieve the same kind of weight loss without surgery, it is important they are getting the correct dietary advice as well.